Pooley Bridge is a lovely village situated at the northern end of Ullswater. It takes its name from the bridge over the River Eamont. Pooley Bridge was formerly known as Pooley or Pool How meaning the hill by the pool or stream. The village accommodates a good selection of shops and three pubs The Sun Inn, The Pooley Bridge Inn and The Crown Hotel. There is also a pier from where the Ullswater Steamers provide ferry connections to Glenridding and Howtown. 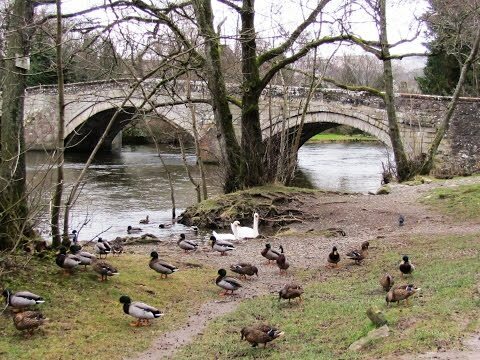 Pooley Bridge, easily reached from the M6, is very popular with tourists, visitors and walkers. Howtown is a small quiet hamlet situated at a small harbour on the eastern shore of Ullswater about 3½ miles from Pooley Bridge. Howtown means farmstead on the hill and was founded by the How (or Howe family). The hamlet houses the Howtown Hotel and an Outdoor Centre. The pier, where the Ullswater Steamers drop off and pick up on the Glenridding to Pooley Bridge cruises, has wonderful views across the lake towards the northern end. The Cockpit Stone Circle stands on a small windswept plateau of land known as Moor Divock which is situated on the eastern side above Ullswater between Pooley Bridge and Howtown. The moor is littered with prehistoric monuments and the Cockpit Stone Circle, which provides wonderful views to the northwest, is one of the most impressive. This Bronze Age circle, 27 metres in diameter, is a low circular bank consisting of about 74 stones of no more than a metre high, some of which are standing and some fallen. A small part of the circle shows it may have had an inner ring of stones. Like all stone circles, its original purpose is a mystery, but probably used for rituals and gatherings, or a sign of land ownership. From Pooley Bridge car park we turn left over the bridge, walk through the village and turn right up the little road on the left of the church. At the cross roads we head straight over following the tarmac track past the caravan and camp site to the end of the road at Roehead. We turn right through the gate and keep heading forwards on the track until we meet a crossroads of tracks and a small cairn on the right. We turn right here and follow the track to the Cockpit Stone Circle. We turn right following the track and keep heading forwards over the open ground, crossing over a stream, towards the trees and a wall corner. At the wall corner we keep heading forwards with the wall on our right. We start to head downhill towards Ullswater which we can see in the distance. Soon after passing a stone barn we see a yellow arrow on a gate on the right but we keep following the track with the wall on our right. We cross over a little bridge with a waterfall on the left. We keep following the track and just after a house the path splits and we bear right downhill past a small building. We turn right through a gate and then left through another gate. We bear left downhill to the gate in the corner of the field. We cross over the road and follow the path at the side of Ullswater to the pier. We return back to the road, cross over and go back through the gate heading back uphill to the little gate to the right of the houses. We now turn left and walk in front of the houses. At the tarmac driveway we go through the gate opposite and head forwards to go over a stile in the wall. We continue forwards to a wall corner and follow the path with the wall on our right. We go through a couple of gates and head to the left of the building. We go through a gap in the wall and head forwards to cross a stile. We head to the next building and go through a little gate at the end of the wall on our right. We go round the back of the buildings and turn left over a stream. We go through a gate and head forwards uphill. At the end of the field we turn left through the gate and then immediate right over the stile. We follow the wall on our right then at Sharrow Cottages we bear right, ignoring the path on the left, following the sign for Thwaitehill through the gate. We head forwards to the next building, Thwaitehill, go through the gate and bear slightly right and follow the track to the next buildings, crook-a-dyke, where we turn left following the sign for Pooley Bridge. We make our way downhill through the fields to the road where we turn right. We follow the road until we reach Waterside House and campsite. We turn left and then right following the sign posts Pooley Bridge 1¼ miles. We head forwards following the track over Hodgson Hill then just follow the lake path back to Pooley Bridge. This is an easy walk to moderate walk on good tracks and paths over open ground and grassy fields. There are some slight inclines and declines and some minor road. Approx 8.7 miles allow 3½ hours using OS Explorer Map OL5, The English Lakes North-eastern area. Start Point: Pay & Display car park next to the bridge and river. Pooley Bridge is situated at the north end of the Ullswater valley, Lake District, Cumbria. From the A66 just after the M6 roundabout take the A592 sign posted Ullswater and Windermere. At the t-junction turn left to Pooley Bridge. Car park is on the left immediately before the bridge and the next car park is on the right after the bridge. Parking: two pay and display car parks and limited free off road parking. There are public toilets in Pooley Bridge and also three pubs the Pooley Bridge Inn, the Sun Inn and the Crown Hotel. There is a range of shops from local stores to galleries, arts and crafts and an outdoor walking gear shop.